For the first time in ten years, the wood-processing company Logosol presents a new Logosol Sawmill. The model passes under the name of M8 and includes a number of new modifications. Comfort and performance have been further raised. A new design gives the small sawyer more possibilities for both efficiency and job satisfaction. 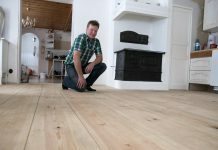 “Our small-scale system has changed forestry all over the world, and become the core of countless wood-processing companies. With the Logosol Sawmill M8, we want to give our customers the best. The model comprises over 20 years of experience of small-scale sawing and offers an extraordinary sawing experience,” says Mattias Byström, Product Manager at Logosol’s headquarters in Sweden. Distributors from all over the world were represented when the Logosol Sawmill M8 was introduced at the Swedish headquarters at the end of October. Easier to handle logs, simpler to set up and more accessories integrated are some examples of modifications. The material is still extruded aluminium alloy, and like its precursor, it can be equipped with several different saw units: the classic petrol chainsaw, the environmentally friendly electric chainsaw, the efficient bandsaw or the log house moulder for milling timber for log houses. 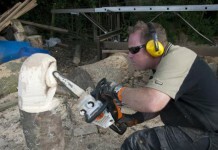 “We decided to develop the most perfect one-man sawmill for chainsaws. We started the development by asking our customers how the most sold sawmill in the world could be made even better. With their thoughts and ideas as a point of departure, we continued the developing project. 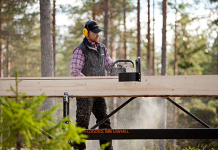 The result is the Logosol Sawmill M8,” says Mattias Byström. Customer focus is an important part of Logosol’s recipe for success, especially when it comes to developing new products. Over the years, early test clients have helped shape machines like the four-sided planer/moulder Logosol PH260, the Soloplaner SH230 and the band sawmill LM Pro. 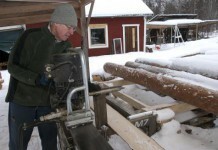 Developing and selling unique machines and services within the field of wood processing is the basis of the company, which was launched in 1989. 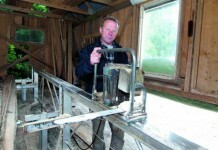 The very same year, the first Logosol Sawmill model was introduced. Today, model 5, model 7 and now model 8 are being sold. 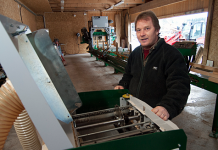 Besides portable sawmills, planer/moulders, joinery machines and band sawmills are included in the line of products. 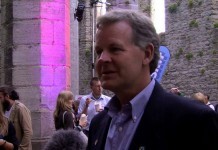 “With sales in over 65 countries, offering a complete range of products is important to us,” says Mattias Byström.